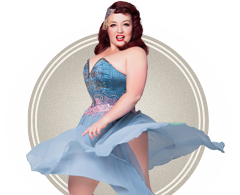 In Volume 2 of this three part DVD series, learn the art of classic burlesque with the showgirls and dancers from Australia's own Sugar Blue Burlesque! 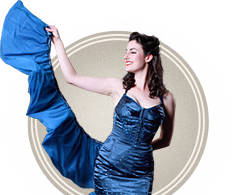 Learn about burlesque costumes, dance, the art of tease, and more! With a saucy burlesque soundtrack featuring Ray Collins' Hot Club, Adam Hall & The Velvet Playboys, South Side Jazz Serenaders, Boilermakers Jazz Band and the Little Jazz Band. 5. Stretches & Conditioning for Splits, with contortionist Kimtortion! Extra Footage includes a Sugar Blue Burlesque photo album, plus footage from live burlesque shows! Starring A'dora Derriere, Bonnie Fox, Sapphire Demure and Kimtortion.